Here’s a new option for building your own AVR programmer. It’s called the MkII Slim and the diminutive size makes it live up to its name. 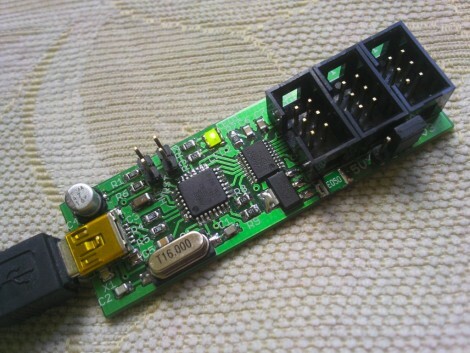 The design is rather spartan, using just three chips; a voltage regulator, a MAX3002 level converter, and an Atmel AT90USB162 as the main microcontroller. This chip has a built-in USB module, foregoing the need for a separate FTDI chip. The firmware is built on the Lightweight USB Framework for AVRs (LUFA). This is a USB stack implementation originally called MyUSB that was developed by [Dean Camera]. Regular lurkers over at the AVRfreaks forums will recognize [Dean’s] name, or his handle [abcminiuser] as a source for many of the high quality AVR tutorials found there. But we digress. The programmer offers all the features you’d want in an In-System Programmer. It can easily be reflashed with future updates thanks to the bootloader running on the chip. There’s jumper-selectable power options, and it can program targets running at 3.3V or 5v. The full development package including code and artwork is available for download at the site linked above. For your convenience we’ve embedded the schematic after the break. And it even works with AVR Studio! Huzzah! Thanks for sharing! So how does this compare to adafruit’s usbtinyisp? 1) The USBtinyISP implements its USB interface by bit-banging i/o pins on a non-USB AVR. This is generally reputed to work, but could theoretically be unreliable under certain conditions. The AT90USB162 in the MkII Slim has a real hardware USB interface. 2) The USBtinyISP is a product that you can buy in kit form. If you want a MkII Slim, it looks like you’ll need to build it yourself! As noted, it is compatible with AVR Studio. For those looking for a cheap and easy programmer that works well with AVR Studio, I swear by this guy for all my needs. Cheaper then adafruit’s usbtinyisp, smaller and no assembly required. I buy enough to just embed them into my projects and connect USB whenever I want to upload a new flash. But this post is a cool choice for build-your-own. O, forgot it also has a second TTL serial port and limited O-scope functionality. Thanks for the linkage. I really like the SLO-scope functionality designed into the device, and especially the fact the maker has made all of the source code publicly available. I tallied about $12-15 for the programmer outlined in this article, but $20 for a slightly-better, ready-made product really ain’t bad! Great project, but on the other hand, the original is only 34$ with a nice enclosure, and no stress about SMD soldering. Not sure it’s so interesting. can i do step-by step debugging with this device? If you want real debugging, use an ARM Cortex-M0/M3 – ARM publishes all the debugging specifications and both SWD hardware interfaces and software debuggers are widely available. As for this build, including ISP, PDI /and/ TPI is excellent! It wasn’t that long ago that I had to bit-bang TPI myself to program an (unsupported) ‘tiny10 chip. If you want to debug, you need a JTAG capable device. Save your pennies and get a JTAGICEmkii-CN from MCUZone in China (I have one and it’s under US$100 delivered and nifty as hell) or a cheaper AVR-JTAG-USB from Olimex – either will work well in AVRStudio4. Programmers like this are simply for reading or writing the flash memory and EEPROM. That’s great if you’re into large production of Atmel based boards or need to do in-field reprogramming but of dubious value to the solo hacker and developer. The TI tools are quite good (though there is a code size limit for the free edition of around 16KB, and it is not available for linux). I have good background in FPGA ,but i’m new to avr. so i decide to create my own programmer. i want to build the best programmer. I think your case is super great. but my question: why there is no code for micro controllers?how you program it? could you explain it? I think it’s the LUFA firmware that he referred to… but I tried, I can’t figure out where exactly the code for the AT90USB162 mcu. The instructions are so wierd and indirect. Hey, forgot to mention in the first section, that before you “make” the project, you need to edit the “makefile” and change the MCU to the correct. Hey, I now got to also test programming an ATxmega128A4U. I switched to 3V3 mode and connected to the PDI connector, and in Atmel Studio 6 tried to read signature, but cannot. Also cannot read signature of ATxmega32A4. It seems that in the documentation, that the AT90USB162 is a “weaker” MCU and has reduced functionality in the programmer. If this limited functionality is connected to my problem, I haven’t found out yet.